Haemophilis influenza type B (Hib) was the leading cause of meningitis in children under 5 years of age when I was born. In the 1970s, the average age of a person in the United States who caught meningitis was 15 months old. That means for every 40 year old there had to be hundreds of infants to bring the average down to 15 months! 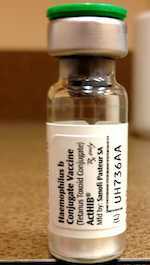 Hib vaccination began in 1985. Shortly after widespread vaccination the average of a person in the US with menigitis was changed to 29 years old. Side efffects with the Hib shot are few most experts report only local reaction, but some list fever as well.